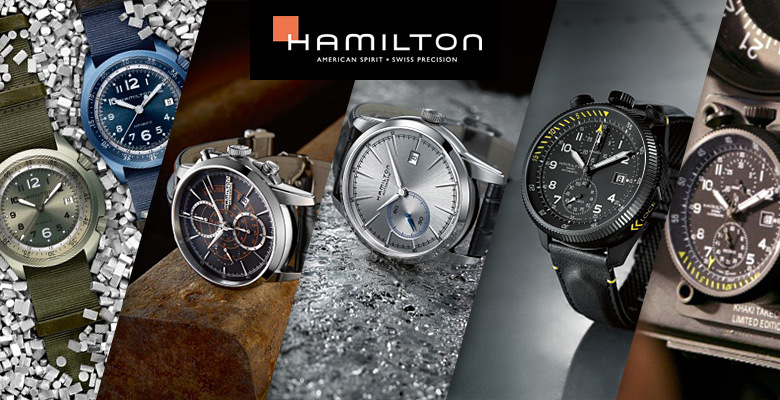 Attainable prices and superb styling – it’s been a great year for Hamilton watches so far with some new and well-received models created to remind us of this company’s links with transport through the years. Now it is time to re-visit some of their new models unveiled earlier this year, which will be available for purchase at your authorized Hamilton dealership in the next few weeks. Earlier this year Hamilton introduced solid aluminium watch cases to their portfolio for the first time, producing four new subtle shades of their Khaki Pilot Pioneer model, in khaki green, sand, black and navy. The aluminium used to create these watch cases has been treated so that it will be durable, and dents will not be a problem for even the most clumsy wearer. This material also promises to wear super-light on the wrist, and it’s colour absorbing properties mean that aluminium receives these new tones better than steel – a quality which Hamilton have put to good use with a varied spectrum of shades with varying degrees of intensity. These models take their design cues from pieces designed in the 1970’s for the British Air Force, so naturally the case overspills to a broad bezel in keeping with watch styling at that time. Each model features an asymmetrical case which measures 41mm across and each is powered by the Hamilton H-10 calibre with 80 hours of power reserve. The crown at the 4 o’clock position provides winding and setting functions while the other at the 2 o’clock turns the internal flange which features a 60-minute countdown timing scale. Uncluttered dials enhance the utilitarian characteristics of these pieces and their distinctive colours which carry through from the dials to the cases and the straps make quite a statement. All four models come presented on matching nylon NATO straps and are priced at $1,145. Two new RailRoad models assert Hamilton’s historical links with transport, and just like the precision timekeepers which railway employees would reach for in order to keep the network running on time, these models feature rounded cases which replicate the pebble-like profile of pocketwatches. The Hamilton RailRoad Auto Chrono comes in two new editions, each with neatly arranged dial layouts, with counters to the centre and left of the dial and with a tachymetre scale which spirals to gently overlap them. The black dial edition has the contrast of a rich hazelnut tachymetre scale and the grey dial option is paired with blue. 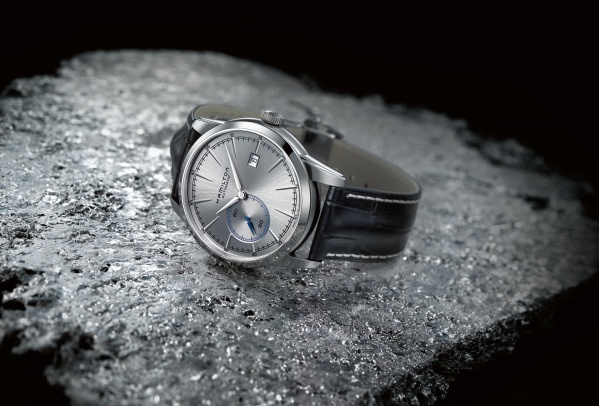 Each is powered by Hamilton’s H-21 self-winding movement. The Hamilton RailRoad Small Seconds models offer precision and an uncluttered dial arrangement. 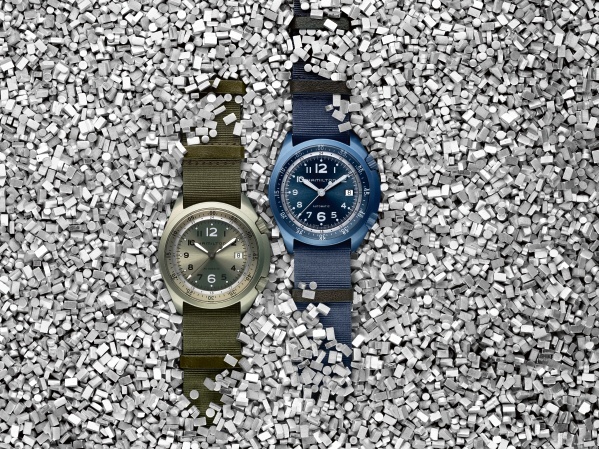 Just like the Auto Chrono models, two choices are offered – black dial with hazelnut or grey dial with blue accents. The quirky 8 o’clock position of the small seconds makes it the main focal point on the dials of these models, as if to emphasise the importance of precision timekeeping on the railroads where every second counts and must be accounted for. The Hamilton RailRoad Small Seconds models gain power from the Hamilton H-22 calibre. 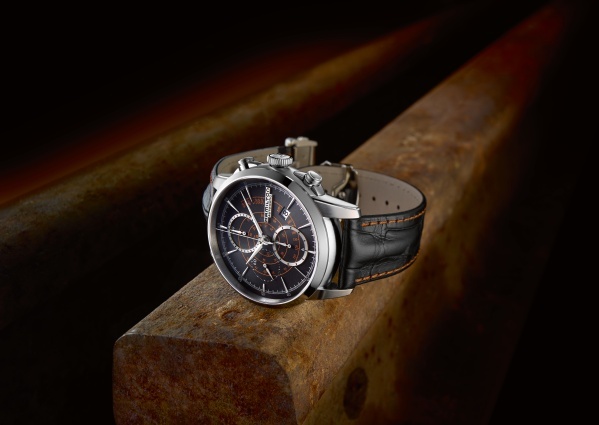 The new RailRoad Auto Chrono and Small Seconds models feature 42mm stainless steel cases and come presented on black leather straps which have stitching to match the dial accents, or on stainless steel bracelets. 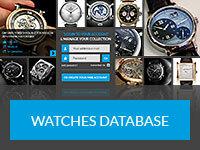 Prices range from €995 Euros to €2045 Euros. Finally, something unusual. 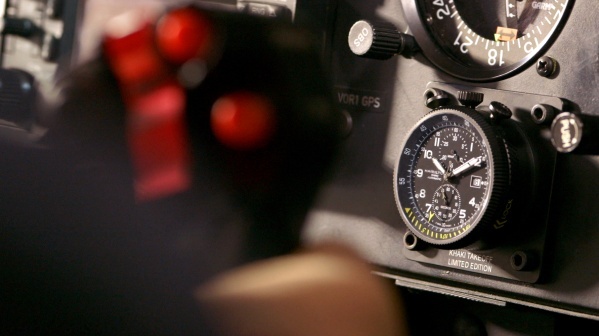 It is no surprise that Hamilton are proud of their associations with aviation but their new Khaki Takeoff Auto Chrono Limited Edition is not simply a dashboard-inspired timekeeper, it doubles up as a real and usable timing instrument for your desk top, or better still, for use while flying. Clever styling ensures that this piece can easily be removed from its strap and placed into its special wooden presentation box where it takes on a whole new character, replicating the aesthetics and usefulness of a model which Hamilton created during World War II. For ease of use, the crown and the pushers have been relegated from the case side to the top of the case, which with a case which measures 46.3mm across also means that it will rest more comfortably on the wrist. 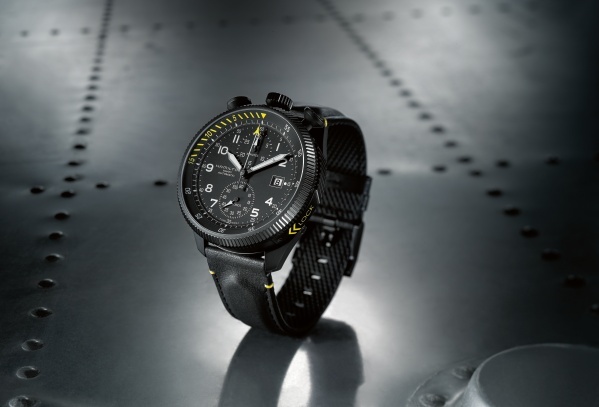 Readability is enhanced with clean dial styling coupled with vivid yellow accents and a black PVD-coated steel case makes this a handsome and distinctive piece. The Khaki Takeoff Auto Chrono model is powered by the Hamilton H-31 movement with chronograph function and it features a power reserve of 60 hours. The model comes presented on a leather strap with rubber lining which folds neatly away into the wooden display box when off the wrist. This piece will be limited to just 1999 pieces, priced at $3,295.